January 25, 1931: This article in the “Los Angeles Times” provided information about Maurice L. Kussell’s “Stars of Tomorrow” all kids show and the rehearsals beginning in the next two weeks. An interesting tidbit is that the net profits from the shows were to be divided among the children who participated. Judy and her sisters, as “The Gumm Sisters,” were a part of the show which premiered on July 10, 1931. January 26, 1936: Judy was considered a “Baby Nora Hayes” for her adult-sized talents., which is how MGM was marketing her during these early months at the studio. She hadn’t yet made a film. True to form for this time, the blurb shaved a year and a half off of Judy’s real age (13 pushing 14). When M-G-M let Deanna Durbin slip through their fingers somebody on the lot must have been sore. 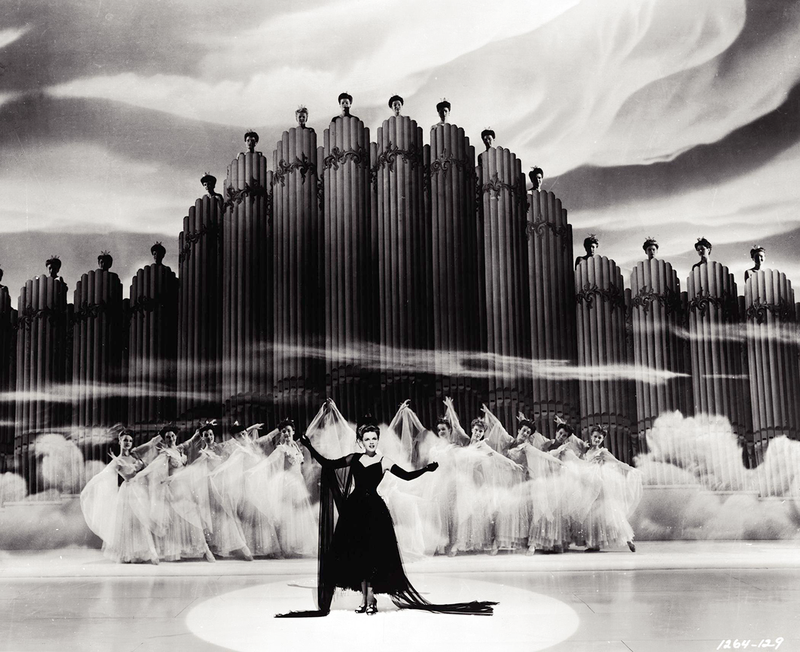 We can just hear him bellowing, “Alright, finde me another!” Judy Garland is the result. 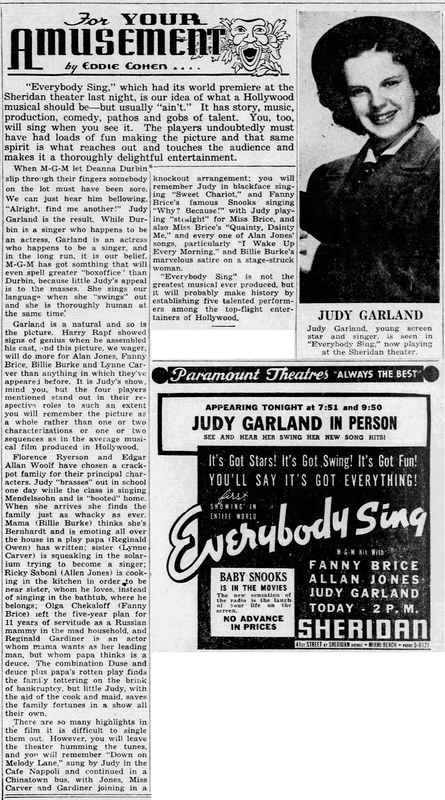 While Durbin is a singer who happens to be an actress, Garland is an actress who happens to be a singer, and in the long run, it is our belief, M-G-M has got something that will even spell greater “boxoffice” than Durbin, because little Judy’s appeal is to the masses. She sings our language when she “swings” out and she is thoroughly human at the same time. January 25, 1941: This little blurb appeared in various newspapers around the country, including the Pittsburg Sun, promoting MGM’s Ziegfeld Girl which was still in production. January 25, 1943: Judy was in the middle of filming on Girl Crazy when she began rehearsals on this date on the newly revised finale for Presenting Lily Mars. 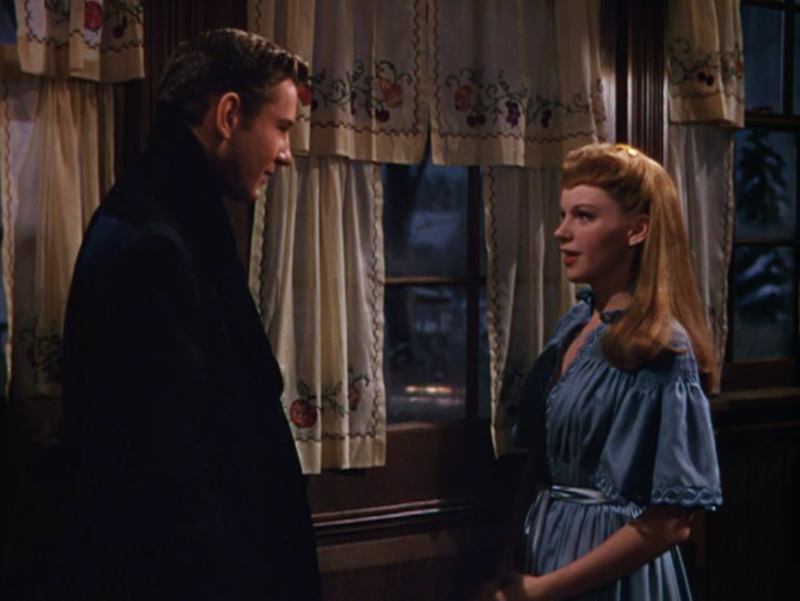 January 25, 1944: Judy and Tom Drake filmed the scene in Meet Me In St. Louis in which Tom’s character (boy next door John Truitt) tells Judy (Esther Smith) he can’t make it to the Christmas Ball because his tuxedo’s locked up in the tailor’s shop (“I Hate Basketball!”). 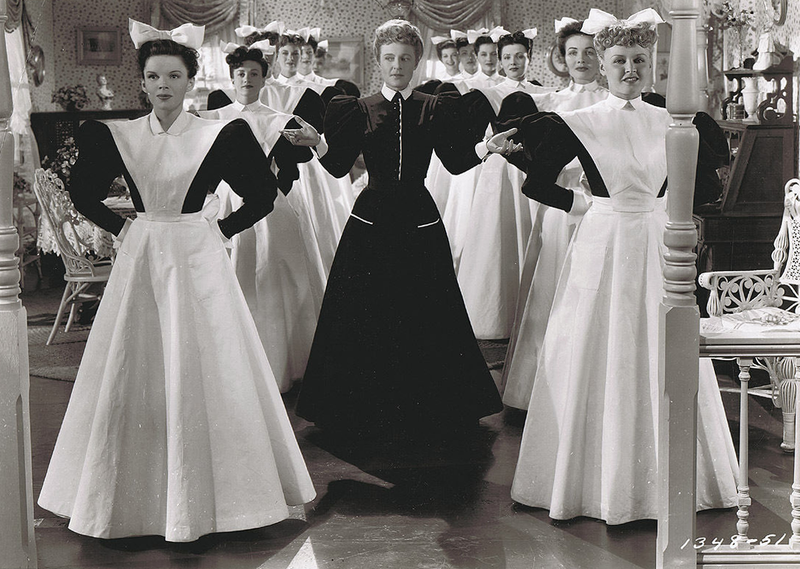 January 25, 1945: The Harvey Girls continued with scenes on the “Interior Harvey House” set. 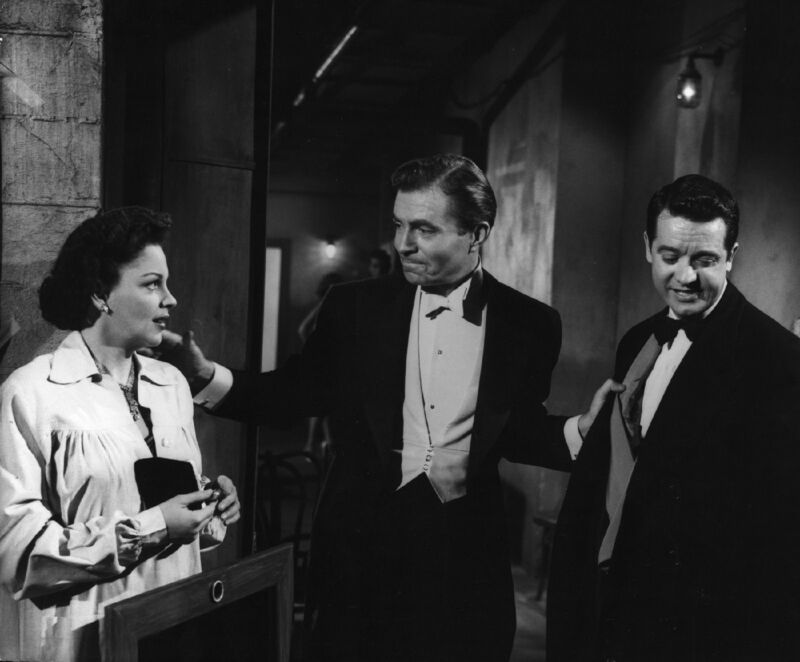 Time called: 10 a.m.; Judy arrived at 11:15 a.m.; dismissed at 5:10 p.m.
Later that evening, The Clock had its first preview at the Academy Theater in the Inglewood district of Los Angeles. January 25, 1946: This review of The Harvey Girls by Herbert Cohn was published in the Brooklyn Daily Eagle. Cohn didn’t care for the film much but did give praise to Judy and her talents, noting her ability to rise above what he saw as second-rate material. 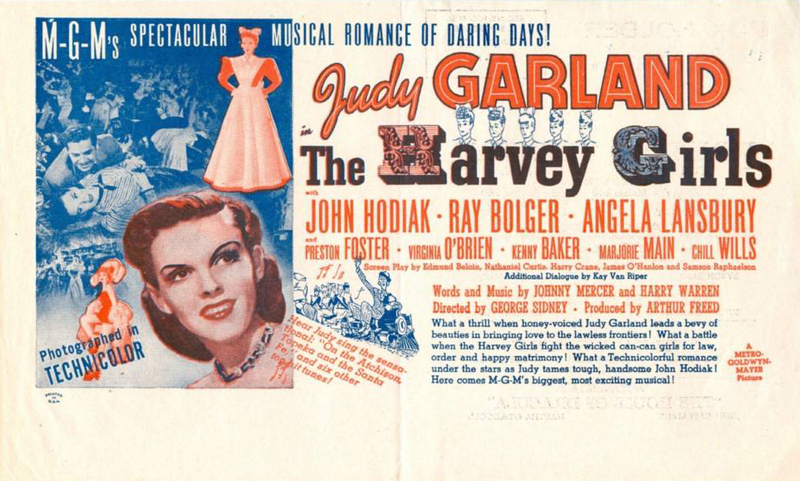 Judy Garland came back to the Capitol Theater’s screen yesterday with “The Harvey Girls.” She brought with her, in addition to a flock of voluptuous Harvey Restaurant waitresses, costumed in the best M-G-M tradition, a score by Johnny Mercer and Harry Warren including the hit tune, “On the Atchison, Topeka and the Santa Fe.” Since most of the Mercer-Warren music is not up to the bar of that catchy little jingle, Miss Garland soon found herself largely alone in a great big Technicolor movie. The going was rugged during most of the 104 minutes. Judy tried hard to put over her show. 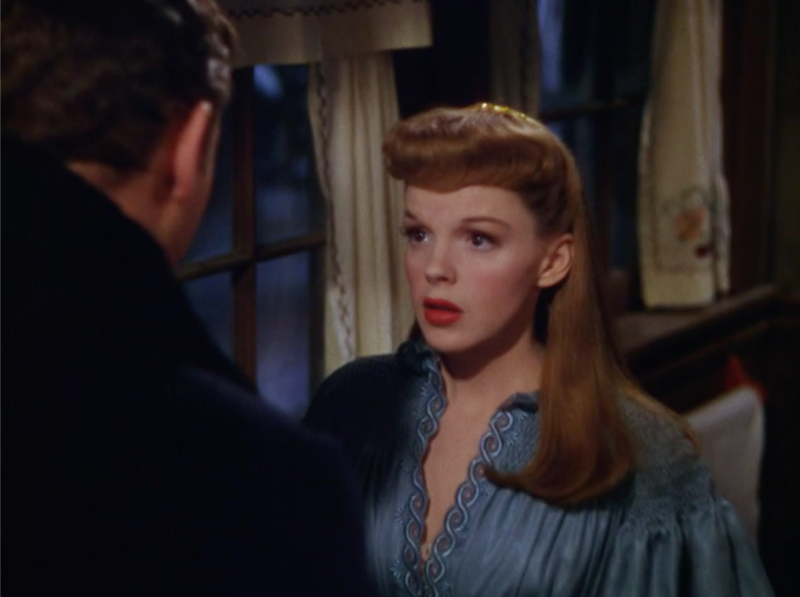 She packed all of her charm – and there was a lot left over from her gayer romp, “Meet Me in St Louis” – into each of her scenes. She proved again that she is as winning an actress as she is a singer, that she still has a flair for high comedy and that she is skilled in squeezing the most from her lines. 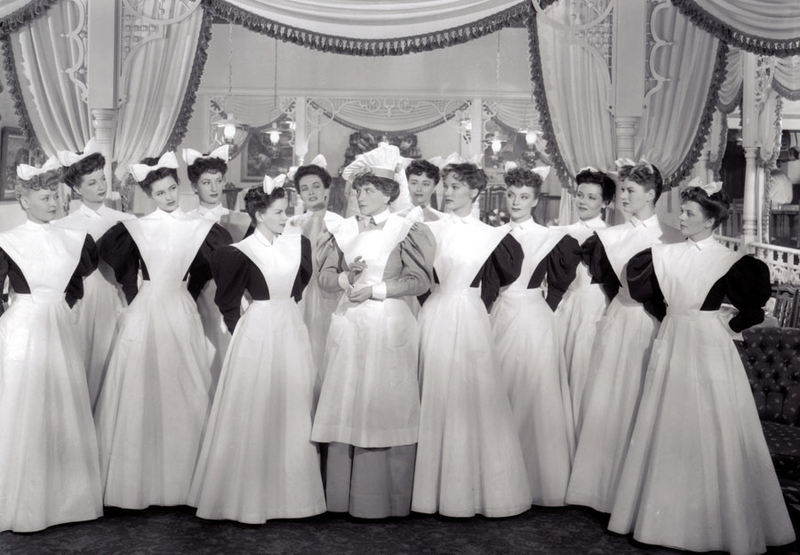 That “The Harvey Girls” turned out yesterday to be less than a first-class musical was not her fault. The fault lay with eight other people, each of whom had a hand in fashioning the script. They gave her little aid. They were amazingly short of gags and of comedy situations, ingredients that usually keep musicals alive between routines. All they offered as the story of Fred Harvey’s restaurant at Sandrock, New Mexico, along the right-of-way of the Santa Fe Line in the Lawless era of the West. Despite lavish color, the earnestness of the star and the lilt of a sure-fire song to bolster them, the eight authors didn’t give enough. Ray Bolger gave Miss Garland a helpful assist with some of his weak-kneed comedy dancing. Virgin O’Brien helped out with customary dead-pan singing to make “The Wild, While West” and “Great Big World” seem to be better musical-comedy music than it is. And Director George Sidney contributed a hair-pulling session between the Harvey Girls and John Hodiak’s neighboring Alhambra Cafe Girls in additional to a crackling fire scene for a climax. “The Harvey Girls,” nevertheless, remained something less than beguiling. Herald photo provided by Kim Lungreen. Thanks, Kim! January 25, 1954: A Star Is Born filming continued on the “Interior Tunnel Under Stage” set. Time started: 11 a.m.; finished: 6:05 p.m.
I’m loving the photo of Judy with Tom Drake. They had chemistry, but his real appeal escaped me until later in life. Now I think he’s a heart-throb. And I even think the kid who played Reuben in “Child is Waiting” is like a miniature Tom Drake! That’s an interesting observation. I hadn’t noticed that about the kid in ACIW.